We had planned to head to the Valley of Fire, but the winds kicked up and it didn’t seem like a good day to go, so…how to fill our day off? Michael suggested a vertical. 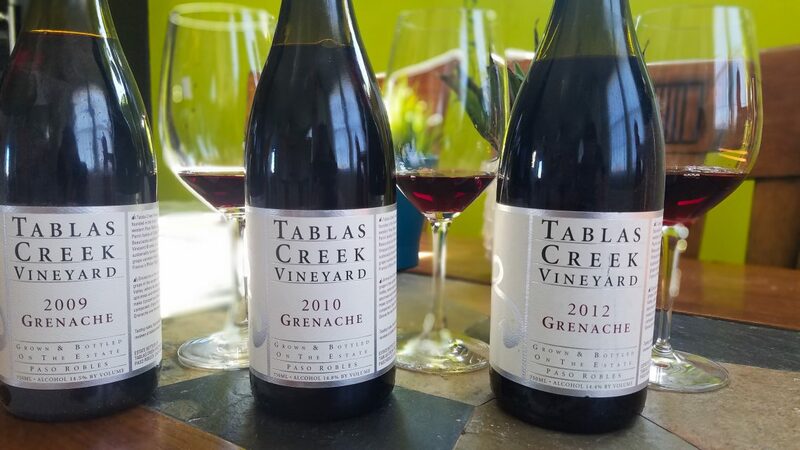 We settled on a Grenache Vertical from Tablas Creek Vineyard. We had a 2009, 2010 and 2012 in the cellar (they didn’t make a single variety Grenache in 2011). First, let’s start by talking about Grenache. The grape likely originated in Spain where they call it Garnacha, but it is found abundantly in France in the Rhône Valley. It is the “G” in a “GSM” (Grenache, Syrah & Mourvedre) which is the traditional Red Blend from the Southern Rhône. About half of the Grenache grown in the world is in France, with the next biggest portion being grown in Spain. As far as the Rhône Valley goes, it is the most widely planted grape and it is the second most widely planted grape in the world! When you have a single variety Grenache you are looking at a Medium bodied wine. Tablas Creek Vineyard is located in Paso Robles in California’s Central Coast Region. 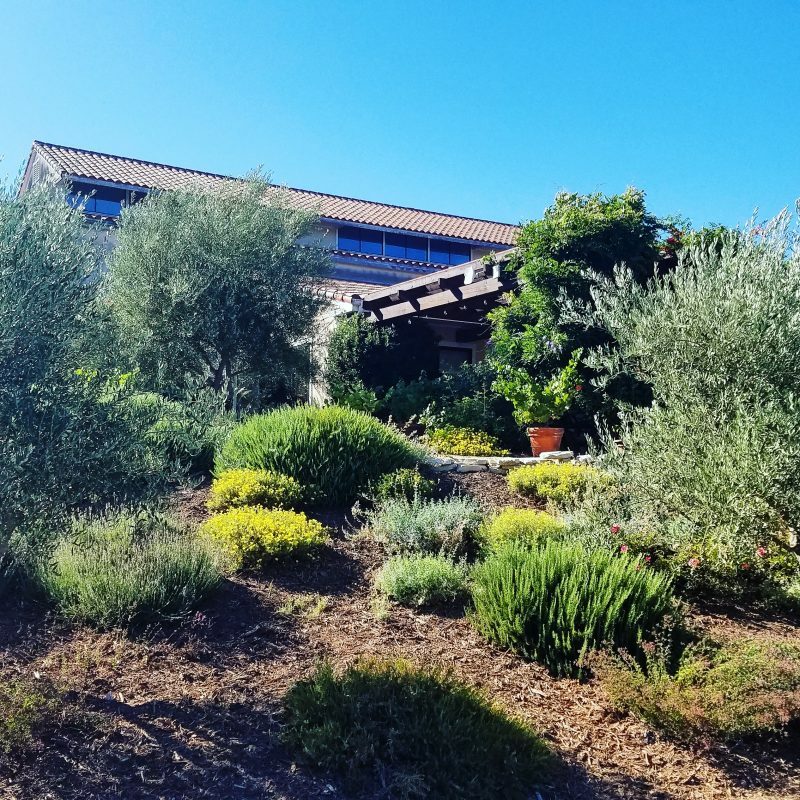 The Vineyard and winery are a collaborative effort between the Perrin Family of Chateau de Beaucastel in the Rhône Valley’s Châteauneuf du Pape area and the Haas Family. Vineyard Brands, the wine import company founded by Robert Haas had been the exclusive importer for Beaucastel wines. They spent 4 years searching for a property that would be similar to the southern Rhône and settled on this piece of land with limestone soils similar to Beaucastel. 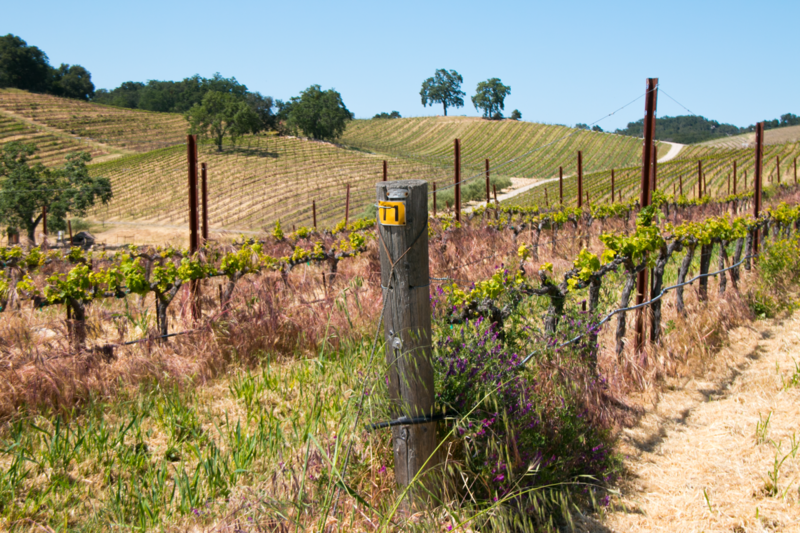 In 1989 they founded Tablas Creek Vineyard on the West side of Paso Robles to grow Rhone Varieties. Hot sunny summer days and cool nights from the nearby Pacific, were just the right conditions. At the time, Paso Robles was one big AVA. This ginormous AVA which covered 614,000 acres of land and had 40,000 vineyard acres, was broken into 11 new AVAs including the Adelaida District AVA which is where Tablas Creek is located. So they found the spot, now it was about the grapes. At this point in time, Rhône grape vines were not abundantly available in California, so they began the process of importing vines from Beaucastel. 9 grape varieties, with several clones from each as well as a variety of rootstocks where selected and imported. Of course that sounds easy right? Just get the cuttings and FedEx them right? Nope. The process is tedious, but important. After the Pheloxera outbreaks in the mid 1800’s and again in 1980’s, regulation to keep vineyards safe was imperative. The first vines arrived from France in 1990 and went through a 3 year process to be sure they were free of all virus’. Once the vines were released they needed to make more vines to have enough to plant. They created a nursery to do this which “at it’s peak produced over 200,000 bench-rafted vines for planting in Tablas Creek’s own vineyard and for sale to interested growers each year.” ( from https://tablascreek.com/story/history) They later partnered with NovaVine in Sonoma to handle this. You can now find Tablas Creek Clones in over 600 vineyards in multiple states. 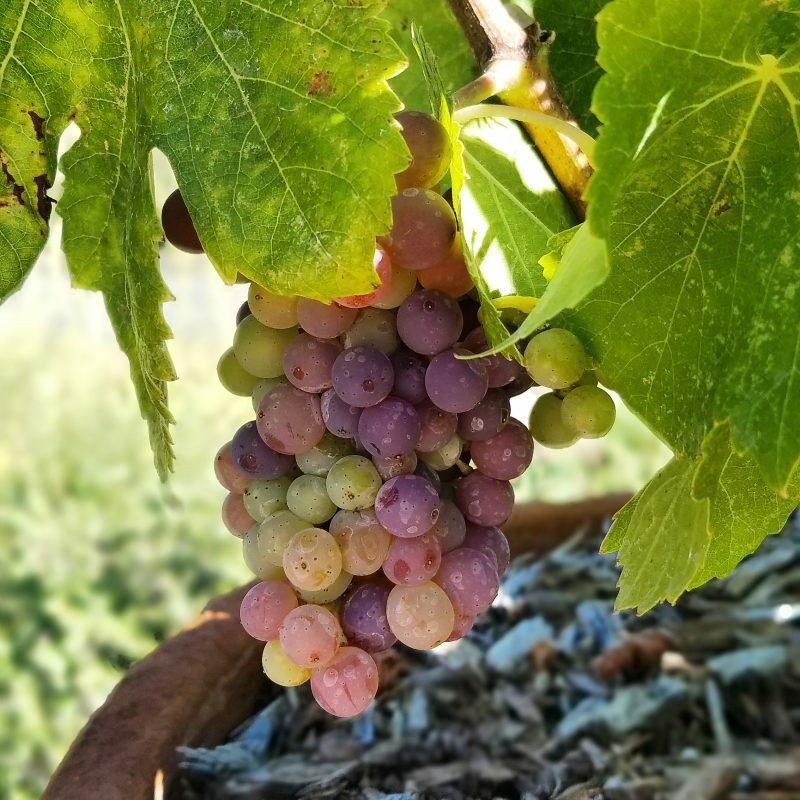 They began with 9 varietals from Southern Rhone, including Grenache, Syrah, Mourvedre, Counoise, Roussanne, Marsanne, Grenache Blanc, Viognier and Picpoul. They continue bringing in varietals so that they eventually will have all of the Châteauneuf du Pape collection. We have been lucky enough to visit them multiple times and even had an opportunity to do an extensive interview a few years ago with Jason Haas their General Manager. You can find all that info here on the website on our Tablas Creek Page. Yes, each of these wines are grown at the same vineyard and made by the same winemaker, but there are differences. First of course is the difference in age, when it was made and how much time it has spent in the bottle before opening. But each vintage is unique. We began our Grenache vertical with the 2009 which was the fourth time that Tablas Creek had done a single varietal Grenache bottling. In 2009 California had been in drought conditions for 3 years. April frost and a huge October rainstorm caused the lowest yields they had ever seen at 1.85 tons per acre for the reds. Low yields do typically indicate more concentrated fruit and that held true for this wine when it was made. This was the 4th bottling of Grenache as a single varietal for Tablas Creek. The Vintage Chart for this wine (which you can find on the Tablas site) indicates that this wine is “Drinking Well: Youthful” while the other two vintages are noted at “Drinking Well: Mature”. Seems strange that the older wine is more tasting more youthful right? 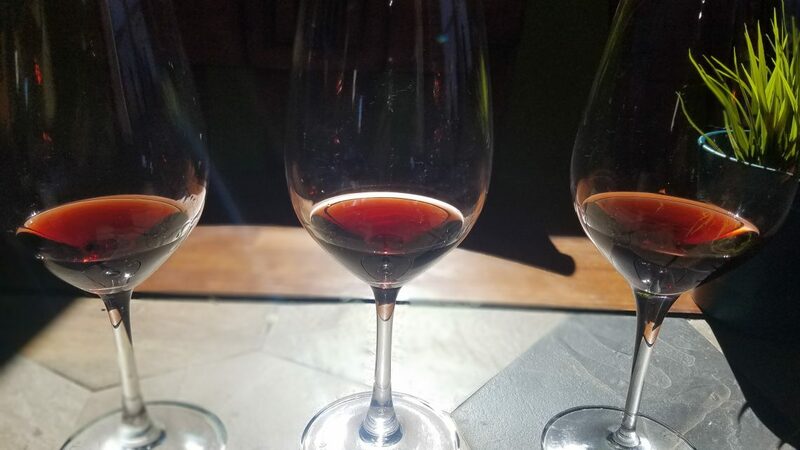 The concentration of this vintage allowed more tannins in the wine to give it more room for aging, and in fact they believe that this wine will continue to age nicely for another decade or more. When it comes to aging wines, these folks know a thing or two. This wine started off warm with red fruit topped with baking spice and prune then it opened up and became spicier with fine ground white pepper. It continued to open through the evening with more herbs and resin. Harvest for this vintage was late, starting 3 weeks later than usual and ending 2 weeks later. As opposed to 2009, yields of Grenache were almost doubled from the previous vintage. The summer was cool, but not foggy and while they had a little rain during harvest, it was followed by sun and wind to dry out the moisture. This wine and the ’12 are expected to continue to age well for the next 15 years. This wine had more fruit on the palate than the ’09 and it was a little figgy on the nose (which caused me to buy some fig butter to pair with it). As it opened up I got a little leather, then prunes and more warmth. The yields from this vintage were similar to 2010 (just a small increase in the tons of Grenache). The sugar levels in the 2012 Grenache sit at just about the same place as the 2010 also. My first impression in the glass was dried strawberries and cocoa. It opened up to more savory notes of black tea on roasted meat with dried herbs and then some caramel at the end. We opened the wines mid day and had a taste to see what we wanted to pair with them. We did not decant, which was recommended and here’s why. We had 3 bottles, and we were planning to pair with lunch and then again with dinner and we did not want to let them dissipate too quickly. So after sipping, we set out to find some pairings that might show up the similarities and differences in our Grenache Vertical. Our lunch pairings included a Beef Shepherd’s pie, lentil soup and then a cheese plate that consisted of Asiago with Rosemary, a triple crème cheese and a Cambolzola (a triple crème bleu), fig butter, cherry preserves, dates, strawberries and rosemary. For dinner, we made bacon wrapped dates, roasted root vegetables (carrots and beets), roasted strawberries with rosemary and crostini’s with cherry preserves and Beef Sirloin Tri Tip in a Kansas City BBQ sauce, which we topped with a little fresh rosemary. The lentil soup: This went well with the ‘09, great with the ‘10 and not so much with the ‘12. The 12 was just a little too fruity to go with the spices, where the 09 was good, but took a little bit of a backseat. The ‘10 was “just right”. The Shepherd’s Pie: The ’09 was really nice, there was less spice in the shepherd’s pie than in the soup and that seemed to lend itself to a nice match with the ’09. The ’10 was a little big for the pie and the ’12 a little fruity but okay. The ’09 wins for this pairing. With the cheeses the Fig butter and triple crème brie were wonderful with the ’09, and the ’10. The Asiago and rosemary went best with the ’10 and the Triple Crème Bleu and cherry preserves were heaven with the ’12. The bacon wrapped dates and the crostini with cherry jam and BBQ tri tip were heaven with all 3. My idea of the roasted strawberries seemed great and the nose and taste seemed like it would be great with the wines, but I tasted alone with the ’12 had me reeling. The sugars in the strawberries made the wine go pure heat and alcohol in my mouth (don’t try this at home). These wines continued to open up. We vacuum sealed them at the end of the evening and popped them open the following day to taste again. They continued to open up in our glasses with more nuances and surprises. Check back for more vertical tastings! We will be doing an Esprit de Tablas (with one Esprit de Beaucastel) vertical with Thanksgiving Dinner! Nobody does American Rhône like Tablas Creek! Jill, it’s so true, but…there we have found some amazing Rhone Varieties in Santa Barbara also. Ballard Canyon is known for it’s Syrah, but of course all the Rhone Grapes grow well there. Larner and Tercero make really lovely Mourvedres that you might really enjoy. Grenache is my desert island grape for some mamy reasons. From the various styles to the nuances of a small region like Paso, to the ever changing magic of the Tablas style – great piece! Thank you! I have definitely fallen in love with Rhones and Tablas has been leading the way with these in California. Thank you so much for the great article, and for all the nice comments on Tablas Creek. This sounds like it was a really fun tasting! Jason, It’s always a really fun tasting with Tablas Creek Wines, ’cause I can find all sorts of geeky facts on the wines on your brilliant website! We are planning and Esprit vertical in the not so distant future. I just need to find a really good duck Cassoulet recipe to pair with it! Any other suggestions? I think we will dig into the 09, 12 and 13. We will hold on the 10 and 11 since they are in a closed phase according to your fantastic vintage chart. Plus…we have additional bottles of each so we can do another vertical after they have aged a bit! 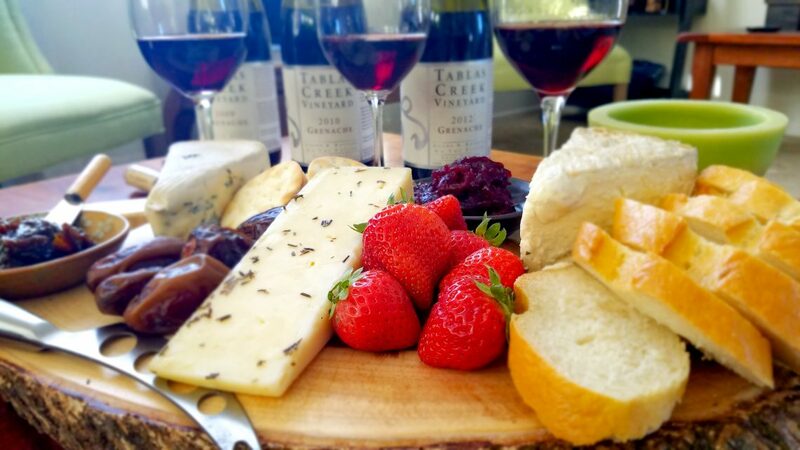 We love Grenache and we love Tablas — they do it so well and always a treat to do a vertical! We can’t wait to get back — they do such a great job with Rhone varietals.